We are pleased to announce that Tim Olson has been hired to oversee race day operations at Elko Speedway. 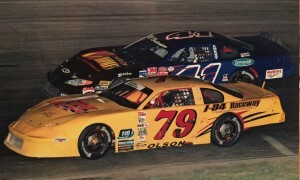 Tim Olson has had a long and successful career in racing both behind the wheel and in management. 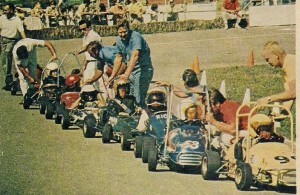 His racing history began right here at the “Little Elko” 1/4 Midget track in 1970 where he raced as a child. Here is a photo printed in the Star-Tribune (Tim is 4th in line). Tim moved to full body stock cars by 1979, he raced at Elko Speedway and Raceway Park but also spent a lot of time traveling. In his 30 year career he raced in many different touring series including ASA, ARTGO, Hooters Cup and others, he turned laps at a total of 57 different tracks all over the country including the Minnesota State Fairgrounds Speedway. Tim then founded the Midwest Tour, its inaugural race was held here at Elko April 28th 2007 with an impressive 55 cars from seven different states entering. 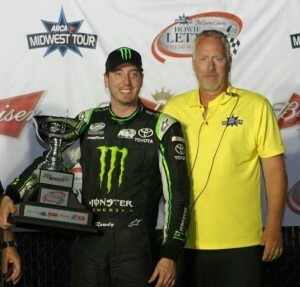 In the next few years the Midwest Tour became the hottest Super Late Model touring series in the United States attracting some of the best racers in the Nation including Kyle Busch (photo below). Elko is very happy to add someone as well respected as Tim Olson to our staff. The next event for Elko Speedway is the Driver Sign-up on Saturday February 27th 1-3pm at the Endzone Bar and Grill in Elko (MN). Elko Speedway is a NASCAR Sanctioned 3/8th mile asphalt racing facility located 20 minutes South of the Twin Cities just off of I-35 and County Road 2 in Elko (MN). The Season opener is set for Saturday night May 28th. Get more information at ElkoSpeedway.com or by following Elko Speedway on Facebook, Twitter and YouTube.